The Paralegal Advanced Competency Exam® (PACE) is offered by NFPA® to test the competency of experienced and skilled paralegals. This exam is one-of-a-kind, in that it is the ONLY certification exam that requires at least two (2) years of substantive paralegal experience for applicants to qualify to sit for the exam. PACE® tests critical thinking and problem-solving skills used by experienced paralegals. PACE®, like the PCC Exam, is not state specific and is a national exam. PACE® questions are level 3-4 and tests abilities to see the big picture. 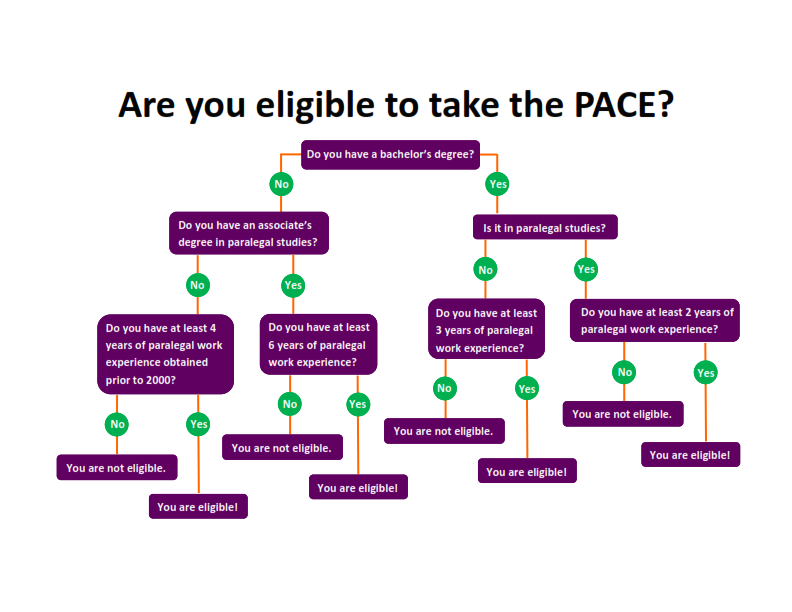 Please note, again, that PACE® is not for entry-level paralegals as there are strict eligibility requirements. The questions are not practice-area specific, but are hypothetical issues testing advanced application of general knowledge, paralegal experience, and critical analysis ability to identify the correct answer. The exam covers tasks that experienced paralegals routinely perform, regardless of the practice area or geographic region in which they live. These tasks were organized into 5 domains: Administration of Client Legal Matters (23%); Development of Client Legal Matters (30%); Factual and Legal Research (22%); Factual and Legal Writing (20.5%), and Office Administration (4.5%). Ethics are included in all of the above domains, as are technology and terminology.